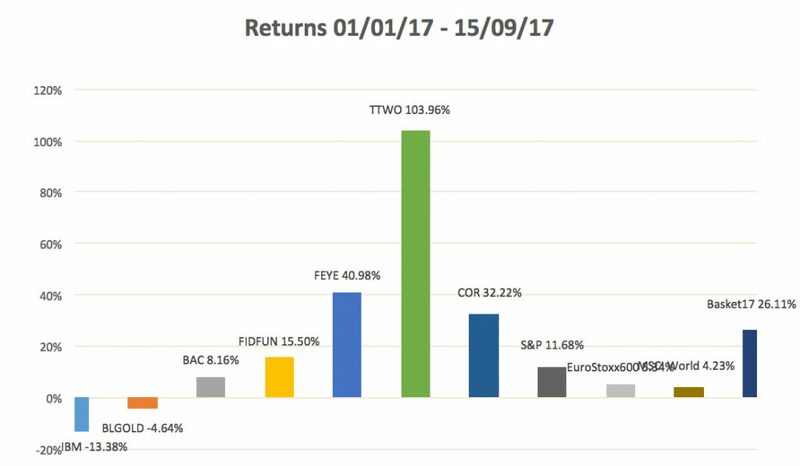 In December 2016, I thought about which stocks would outperform the market. When I released my report of 2016 nine months ago, I included these stock picks at the end of the document. Contrary to last time, not 8 but 7 stocks were picked. To be completely fair, 2 of those picks are Funds. On a step-by-step basis analysis of the firms will appear on this website (when I find the time). This is a follow-up report since May 5th 2017. Please refer to the report of May 5th to compare the numbers. The return of each individual security on 16th of September 2017 has been benchmarked to the S&P Index, Eurostoxx600 and the MSCI World Index. The bar on the far right, “Basket17”, is computed as an average of the seven stock returns. 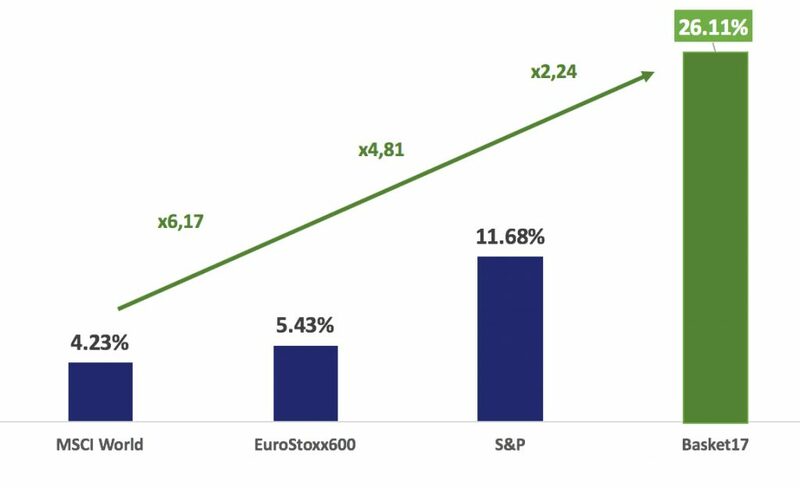 Until now, it has outperformed the markets by a factor of 2,24 for the S&P, 4,81 for the Eurostoxx600 and 6,17 for het MSCI world. IBM and BlackRock Gold have doubled their losses relative to the previous report in May. Continued political tensions and a weaker dollar have strenghted gold prices, yet gold miners failed to profit from this evolution. Fidelity Fund India has stagnated since the previous update, but remains at double digit positive numbers. The Equifax hack showed us that cybersecurity has not been taken seriously enough by big corporations. New regulations soon to be introduced should bolster demand for cybersecurity services. 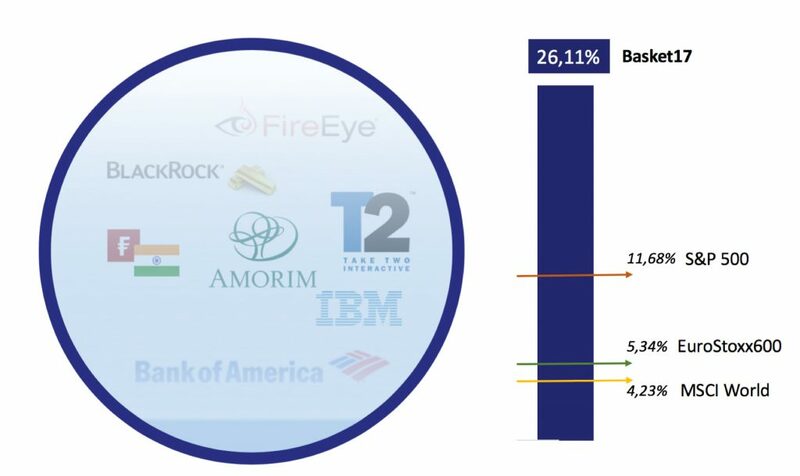 US-based FireEye has been my pick since it was a much hated stock. Numbers are turning more positive and some great new personnel additions to the company have been completed. Gaming company Take-Two Interactive has now doubled since the start of the year and is nearing x3 since I first recommended it January 1st 2016. Finally, Corticeira Amorim has stagnated since the previous report, but did two take-overs in France to grow market share and take advantage of economies of scale. Bank Of America has made slight gains since the previous report. I finished my major Economic Sciences (globalisation) at Ghent University. After discovering Asia with a backpack, I worked at Deutsche Bank Belgium for 6 months. 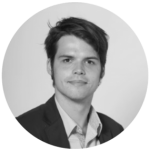 After finishing my Master in International Management and Strategy degree at the Vlerick Business School in Brussels, I am currently employed at a data-focused start-up in Brussels.